As the body count rises, she has no choice but to seek answers. Joy dives into the mysterious bowels of the city, uncovering secrets with far-reaching consequences for PsiCorp… and all of Apex City. I enjoyed the first book, and can’t wait to see what happens to Joy next! This was on my TBR shelf for a few months, and when I received it in one of my subscription boxes it was time it came off the shelf. This book sadly took me awhile to get into. I couldn’t connect with the characters for the longest time and the plot took awhile to pick up pace. First, I’ll just say that this book was heavy on romance. There was the cliche of a love triangle, as well as another girl in love with one of our triangle boys. Pasha and Nikolai both are in love with Vika, and Vika thankfully is in “love” with only one of them. As I said the book was heavy in romance, but there wasn’t an actual couple per se. The game kind of came in the middle so they (Vika and Nicolai) didn’t know until basically the very end if their feelings were real towards each other. Also, there didn’t even need to be a love triangle. Pasha didn’t contribute any angst or tension between Vika and Nikolai, it just seemed as if they had this instant connection and only the game stood in their way. Yes, you guessed it instalove, but drawn out instalove. Poor Pasha never stood a chance. One would think that a book based upon a game to the death that magic would be overflowing and it would be action packed. Alas, that is not the case in this book. Yes, Vika and Nikolai are both enchanters, but they don’t use their magic that much. Or at least not in a way that you expect it. In the game, they each take turns to try to impress the tsar and at first they tried to kill each other. But you know, feelings kind of got in the way of that. So instead they just tried to one up each other and spared their life because they had a magical moment at the masquarade ball. (Que Cinderella moment here). There was one moment in the book that I thought would redeem everything! Without giving anything away, this character could have been a great villain for our two enchanters. But instead the character had a minor role, maybe in the next book they will be utilized more. Only time will tell. Overall, it was an okay book. I thought it could have been better with maybe another edit or two. It definitely needed more action packed scenes and magic duels! So if light fantasy and romance is your genre of choice, then you’ll definitely enjoy this book! She has a powerful secret… with deadly consequences. For years, Eon’s life has been focused on magical study and sword-work, with one goal: that he be chosen as a Dragoneye, an apprentice to one of the twelve energy dragons of good fortune. When Eon’s secret threatens to come to light, she and her allies are plunged into grave danger and a deadly struggle for the Imperial throne. Eon must find the strength and inner power to battle those who want to take her magic… and her life. This was a recommendation from a friend about two years ago, and I finally put it on my TBR shelf about two months ago. Have you read Eon yet? What did you think? Lit-Cube is a monthly subscription box that sends you a book, a wearable, and other little bookish goodies. <–This is what it looks like on the inside, after you first open it! The anticipation is exciting. 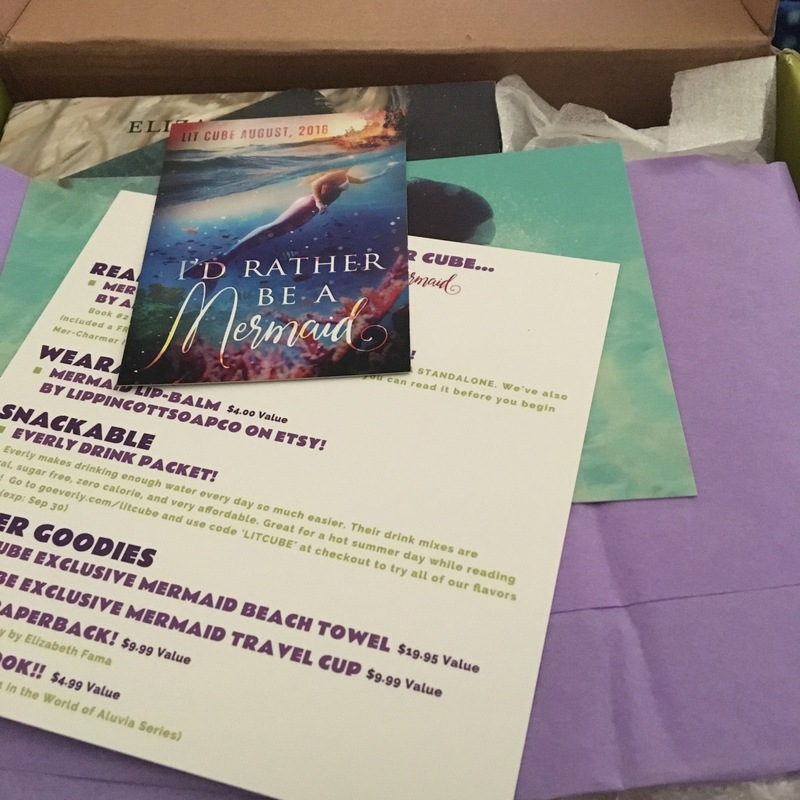 This months theme was “I’d Rather Be A Mermaid.” I love all things mermaid, so waiting all month for this box was torture! Check out my other Lit-Cube reviews and book box subscription reviews ! After the theme card, comes the description card of all of the items included in this months box. Would you rather be a mermaid A witch? A faerie? Or a werewolf? Choose your favorite paranormal story and download samples from The Cotton Candy Quintet! 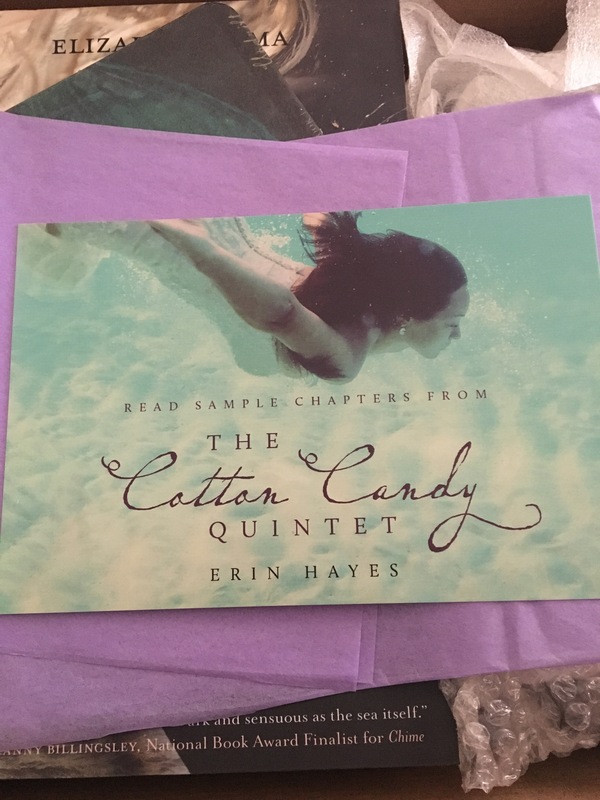 I thought this was a cute way to promote Erin Hayes’ books from The Cotton Candy Quintet. 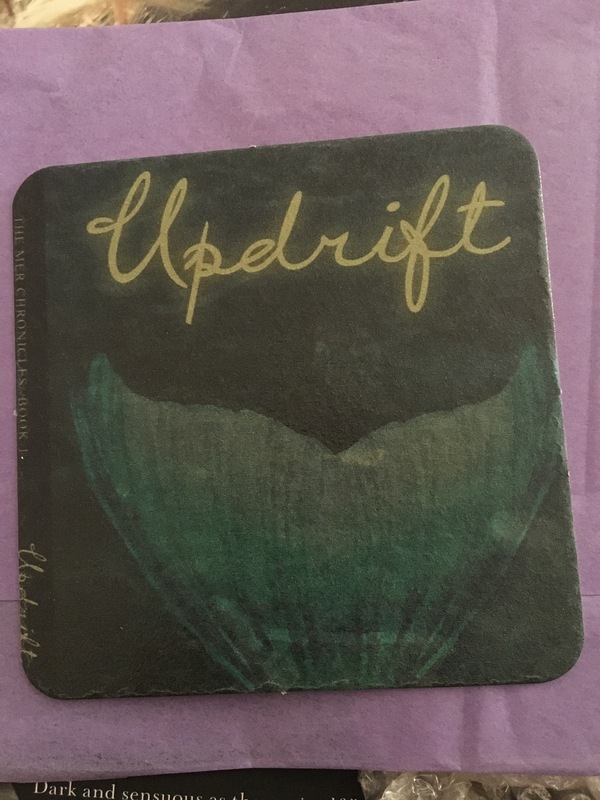 Another promotional item in the box, is this Updrift coaster. Updrift is the first book in The Mer Chronicles by Erinn Stevens. The coaster is really cute, and after looking it up I found out it is also the cover of the book, so I will definitely have to check it out! The book this month is Mer-Charmer by Amy Bearce. This is book two in the World of Aluvia series, but it can be read as a standalone, which is great because I haven’t read the first one yet! The retail value of this book is $16.99, but you can find it on Amazon for $16.14 (at least you get a 5% discount!). This book has an interesting premise. I have read some really good mermaid books and some that are not so great. I really hope this falls in the first category! If you haven’t read the first book (Fairy Keeper), like me, Lit-Cube included a free ebook download! If you have Kindle Unlimited you can read it for free, but if you are like me and don’t you can purchase it from Amazon for $4.99. For an ebook that is not a bad price. This month, we not only received a paperback book and a free ebook, but we also got another paperback book! My TBR list is growing quickly! Published: October 1st 2013 by Square Fish (first published September 4th 2012). This book has some great reviews on Goodreads, and I can’t wait to dive into it! (See what I did there? ;)). This book has a retail value of $9.99, or you can get the Kindle version for only $7.09 on Amazon. 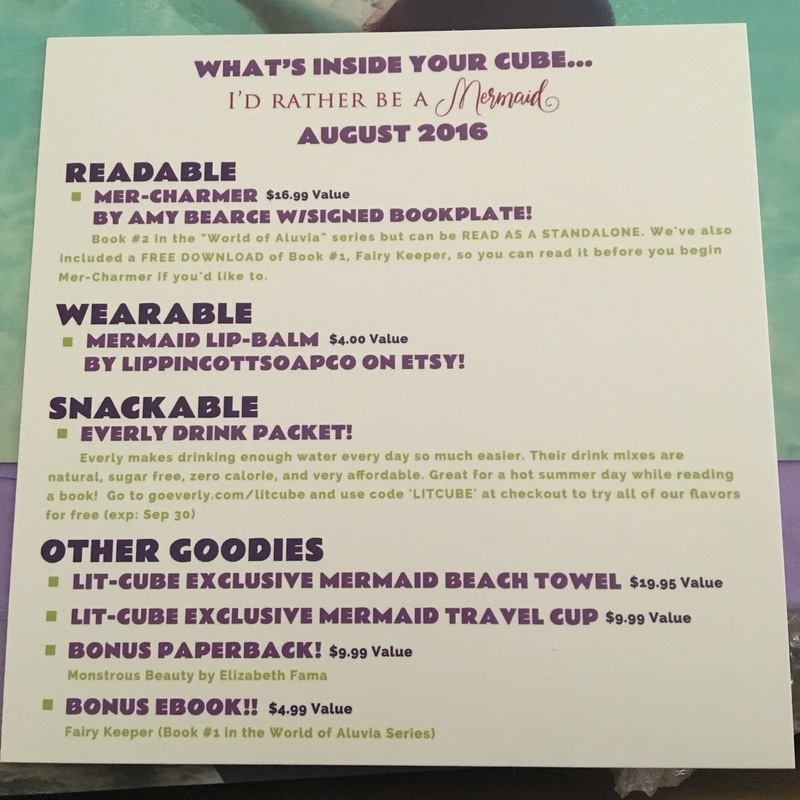 Another goody this month, is this Lit-Cube Exclusive Mermaid Travel Cup! It is super adorable, and I love that it is in purple! This travel cup has a retail value of $9.99. Inside the travel cup was all of these goodies! 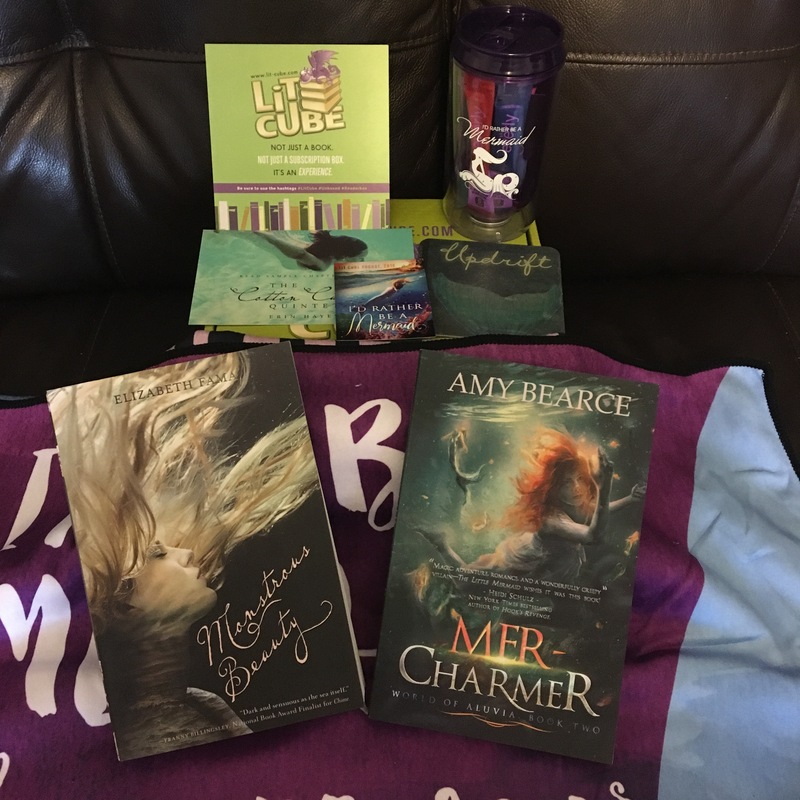 There was some promotional items for more mermaid books, a signed bookplate from Amy Bearce, a couple of drink packets, and a lip balm. If you join Poppy Lawless’s newsletter, she will give you a free copy of The Glass Mermaid (book one in The Chancellor Fairy Tales series). All my life is as fragile as glass. What would you sacrifice to save the one you love? This months snackable are Everly Drink Packets! These drink mixes make drinking water every day more enjoyable. “Their drink mixes are natural, sugar free, zero calorie, and very affordable. Great for a hot summer day while reading a book!” We even got a code to try all of the flavors for free! They have a 3-day challenge to kick the soda and sugar out of your diet for only $10, and a box of 30 packets is only $17.50. Since we received two samples, I would guess that the estimated value is $1.17. We even received a pitcher packet, but I couldn’t find that one on their website. I received Peach Mango, Green Tea Passion Fruit, and Strawberry Lemonade to try! The wearable in the box is the Mermaid Lip-Balm by LippincottSoapCo on Etsy. Their “Mermaid” lip balm smells just like a rainbow snowcone! This is a creamy, scentless balm that stays on for hours. The ingredients in this balm are beeswax, jojoba oil, shea butter, cocoa butter, phthalate-free flavor oil, castor oil, lanolin, and vitamin E. This has a retail value of $4.00, but if your purchase is $50 or more they have a coupon code for 10% off! “I must be a mermaid. I have no fear of the depths, and a great fear of shallow living.” Believe it or not, but this is a beach towel! This is the last Lit-Cube exclusive item in this months box with a retail value of $19.95. I love the quote on the towel, but it doesn’t feel like a towel. It seems as if it is more like a blanket, but still cute. Overall, this box has a value of $66.23, not bad for a $34 subscription box! I think since I have been subscribing, this has been the most highly anticipated box and it did not disappoint! I loved that this one came with more than one book and all of the bookish items were great! Next months theme is “Haunted Hearts” and it is being guest curated by AG Howard the author of The Architect of Song (which will be the book next month). Everything in the box will be hand picked by Howard, how exciting! What do you think of this months box?! Do you love mermaids just as much as me? What do you think of next months theme?? Check out my Facebook page and let me know if you have one as well! Minor spoiler alert (I think)! This book came in my August Uppercase subscription, and I am so glad that it did! I have been reading a lot of fantasy lately, and it’s nice to mix it up here and there. This was a very cute story about two “anonymous” pen pals trying to pass their time in chemistry class. This book reminded me a lot of A Cinderella Story with Hillary Duff and Chad Michael Murray. The only difference is they wrote e-mails and in this story it’s old fashioned letters stuffed under the desk. Lily is described as weird, quirky, and kind of hipstery (is that a word? Well it is now). She is a self-taught guitar player who likes to write lyrics, and wants to submit a song to a competition. All throughout the semester, Lily can’t find the words and makes excuses to not share her lyrics with anyone. Cade is the exact opposite of Lily. He is “mainstream” and very popular at school who also happens to play baseball. From Lily’s pov, we see Cade as a class A jerk, who is always trying to make Lily miserable. They have a hatred for each other that goes back years. When Lily finally explains why she hates him, I just don’t see how one incident could incite such hatred. Plot wise this book moved very quickly. There was a lot of highs and lows and for the most part I followed along the emotional rollercoaster with Lily. I got so caught up in the moment, that I found myself smiling when something cute happened and tearing up when Lily starts crying. This story is nothing if not a walking cliche. Almost every situation was a cliche of some sort, but for the most part it didn’t bother me too much. Let’s see…boy drama? Check. Friend drama? Check. Mean girl trying to ruin main protagonists happiness? Check. Love triangle? More like a brief square that never really amounted to anything, but check. West could have ruined this book by having a love triangle be the main focus. Thankfully, it didn’t last long and two of the boys came in and out of the picture fairly quickly. (Whatever happened to the clarinet guy who kicked the rabbit? Two dates and he just disappears for good?) At least with Lucas we know why he is no longer in the picture. The relationship between Lily and Cade progressed naturally, and I just wished that she got over her prejudices earlier so that they could have been a couple more in the book! Need a quick contemporary read with a sense of humor? Then I suggest picking up this book! Totally worth it. So…I created a Facebook page! I took the plunge (and I had an afternoon off from work) and created a Facebook page for my blog! Click here to like my page!!! Do you have a Facebook page for your blog? Let me know so that I can like your page! I would also love some tips/suggestions! I discovered this series last year, and I have devoured the first three books! I am waiting for the 4th book to come out in paperback so that I can read it, but I am so looking forward to this book coming out! Maas has become one of my favorite authors, and I wish I had started collecting her books all in hardcover so that I don’t have to wait to buy them! 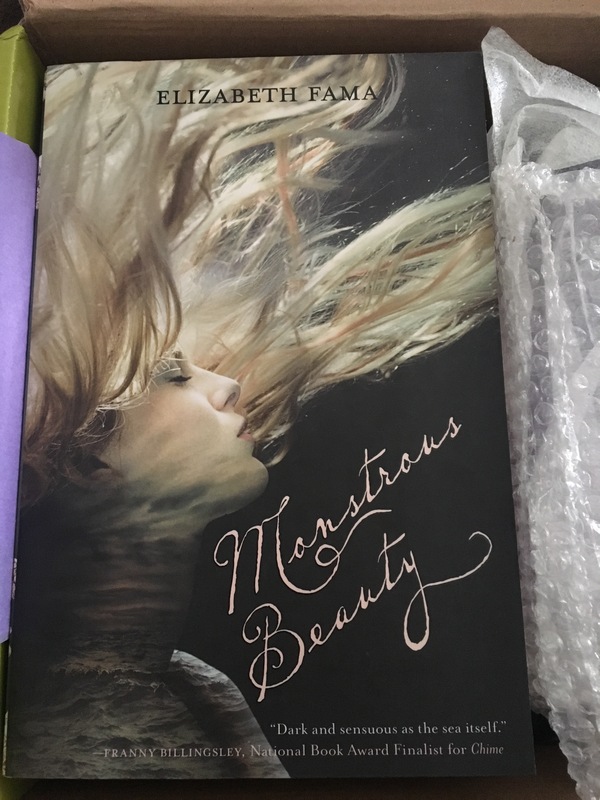 I received this book in one of my YA book box subscriptions, and I am so glad I did! I most likely wouldn’t have stumbled across this one at least for a little while. I highly enjoyed this book and the author was correct when describing this book “Sin City PLUS Romeo and Juliet MINUS romance PLUS monsters.” You definitely got that Sin City vibe minus everything being in black and white with hints of color. August is a monster who wants to be human. Throughout the entire book, we see him struggling with what being a human means and how to not got dark and loose what humanity he has. Probably out of all of the characters, August grew the most and truly realized his purpose in life. Which, I am honestly glad he embraced his true self, hopefully in the second book we will see a little less emo August. Kate, on the other hand, was a little bit harder to like or even relate to. She is coming off as this strong and independent person who is trying to prove her worth. But all I see is a girl with way too much privilege. The very first act we see from Kate, is her burning down a little chapel, not because she needed to but because she wanted to. She viewed it as the only way to get kicked out and sent back to V-City. Even the cop who escorted her knew she was a privileged kid and only gets away with things because Daddy pays for it. After she finally gets her way, Kate still just does whatever she wants. Nothing has changed just the location. Even throughout the whole book when she is trying to stay alive with August, I felt like Kate never changed. She was a very one dimensional character. The plot was very intriguing. Following along with Kate and August, I thought I had it all figured out on who the bad guy was and was totally thrown for a loop. Although, I should have seen it coming I missed it. The plot did start off slow at first, but after awhile it started to pick up and then I couldn’t put the book down until I finished! The whole thing was well written, and very action packed (of course with monsters thrown into the mix, it would be hard not to be!). I would definitely suggest picking up this book if you have the chance! If you read it already, what did you think of it? This book has been on my TBR shelf for a couple of months, and it was in my Best Damn Book Box for June. So after I finish reading my current book, I think I’ll pick this one up next! Have you read this book yet? What are your opinions on it? 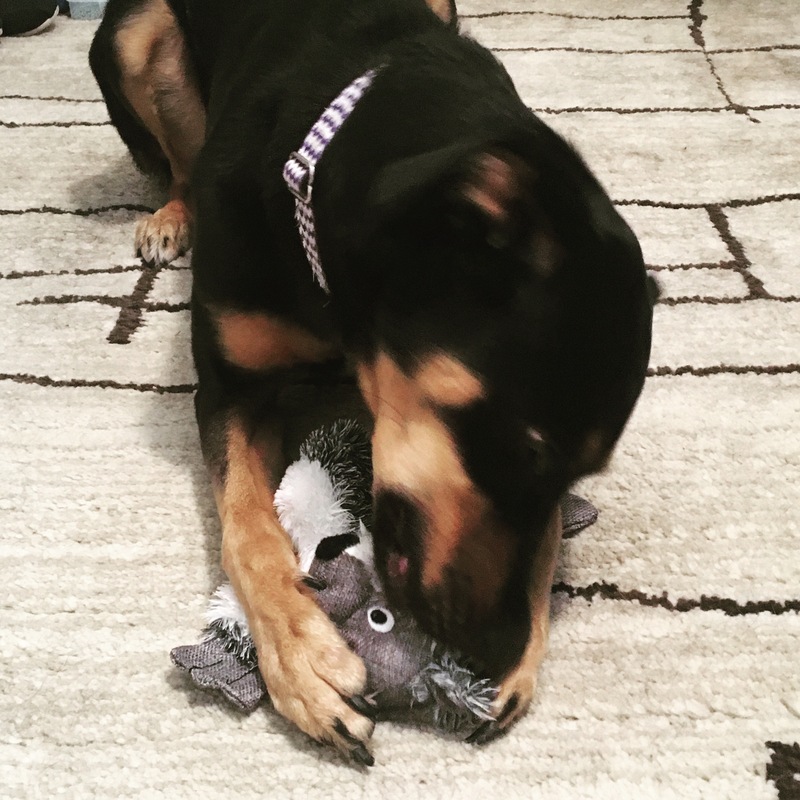 It’s a rare moment to find my dog playing with an actual toy. She normally just takes it from the other dog and just holds on to it, instead of actually playing with it. I’m glad she found a toy she actually likes to play with, too bad it also became my other dogs new favorite toy!